The letters of the Green Family of Knutsford are copyright © Jean Jamison 2009. The Jamison collection are now at The John Rylands Library and the letters are reproduced by courtesy of the University Librarian and Director, The John Rylands University Library, The University of Manchester. copyright © Simon Barcham Green 2009. 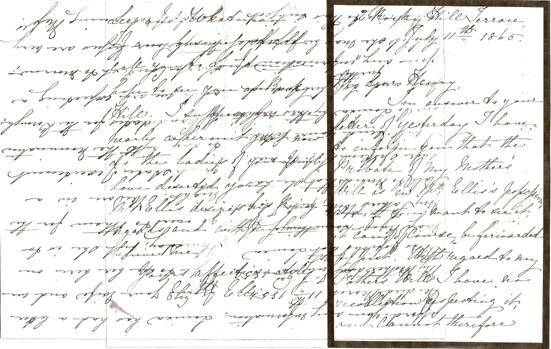 An example of the difficulty faced on occasions when trying to transcribe letters of this period when the person cross writes to save paper. 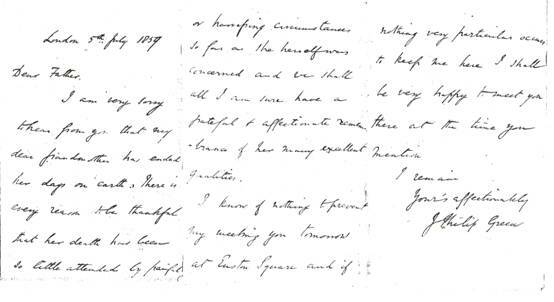 The collection of letters written and kept by the Green and Jamison families run to many hundreds and only a small part of the collection has, at this time, been transcribed. The correspondence reproduced here has been divided into several sections. From 1845 – 1860 most were written by John Philip Green to his parents and sisters. After 1860 the majority were written either to or from Isabella Green to her family and close circle. The letters transcribed and reproduced here form part of a large collection written by the Green families of Kent and Cheshire. They were prolific letter writers and to our advantage much of the correspondence was retained through the generations. The Green family originated in Milton near Gravesend in Kent and moved c1727 to East Malling where John Green senior was baptised in 1730. He married Jane Jones in 1764 and they had three sons Samuel, John and William and several daughters. Samuel became a carpenter, builder and surveyor and lived in Sevenoaks. William became a Victualler. John became a papermaker and worked with William Turner at Chafford Mill at Penshurst marrying William’s sister Ann in 1800. In 1814 John purchased Hayle Mill at Maidstone where he manufactured paper until 1838 when he, and two of his sons John jnr and Charles William, went bankrupt. His brother Samuel saved them from bankruptcy and took over the paper mill. John and Ann Green had seven children, Henry, John, Ann, Emily Jane, Charles William, Louisa and Elizabeth. Nothing is known about their schooling, however they were all well educated which was usual for children of a non-conformist family. Ann married Benjamin Mardon in 1828 and Emily married Henry Powell in 1836. After the business failed John senior remained at Hayle Mill as manager on the understanding that he trained his nephew John Barcham Green to take over the mill, which he did in 1852. Louisa and Elizabeth set up a school for girls in Ashford Road, Maidstone. Elizabeth married Charles Ellis in 1861, Louisa remained unmarried. Having left Kent, John jnr became a successful paper agent and later founded the business of John Green & Son in London with his eldest son Frank, which in turn became Frank Green & Co. Frank Green became Lord Mayor of London in 1900. Charles had a rather chequered career and died in 1884 in Devon. The majority of letters copied here were written by the family of the eldest son Henry. He was born at Penshurst, Kent in 1801. In 1819 he began his training for the Ministry in Liverpool under the Rev. George Harris, becoming a student at Glasgow University in 1822, where he distinguished himself in classical literature, logic, moral philosophy and physics and won many prizes. At that time students did not live within the college precincts but were either boarded with professors or had lodgings in the town. Details of students’ expenses in 1826 were estimated between £16 and £17 a year including class fees, books, board, room and rent, on which it was said they were able to live in comfort. Classes took up eight hours a day, with four classes of two hours each, so there was little time for outside activities. Amongst his peers at the university who were to became lifelong friends were the Rev. 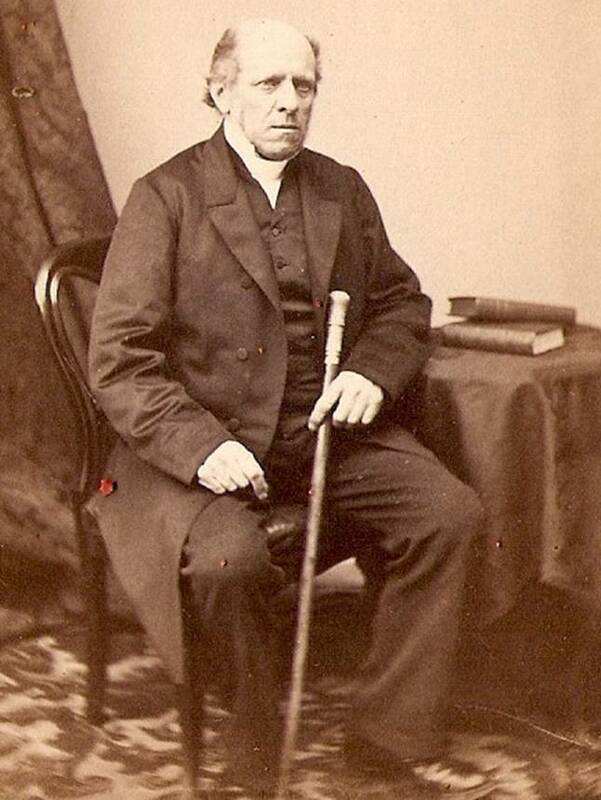 John Cropper, the Rev. Henry Hawkes, Lord Justice James and Rev. William Gaskell. The latter, his wife Elizabeth, the authoress, and daughters were very close friends of the Green family and they feature in many of Elizabeth Gaskell’s letters, as do the Gaskells in the Green’s correspondence. In 1824 Henry delivered a Lecture at the Unitarian Baptist Chapel at Bessel’s Green, where the family of his uncle Samuel worshipped, and between May and October he earned £22 for taking the services for twenty one Sundays at the Earl Street Chapel Maidstone, where his family were members of the congregation. In April 1825 he gained his Masters of Art degree and then taught in the school of John Relly Beard, in Manchester. The following year he preached as Minister in Hanley, Staffordshire and then supplied Diss, Suffolk, during 1826. In January 1827 he became Minister at the Unitarian Chapel, Brook Street, Knutsford Cheshire, where he remained for forty-six years until his resignation in June 1872, finally giving up at the end of December that year. He married Mary Brandreth at Bolton Le Moors in Lancashire in June 1827 and in July made his first entry in the Chapel registers. Their first child Emily was baptised by William Gaskell at Bolton Le Moors in August 1828, she never married. Their only son John Philip was born in 1831. Anne Louisa born 1833, married Charles Falcon, a widower, in 1863. Mary Ellen born 1835 never married and she and Emily lived together until their deaths. Alice born in 1837 died in 1842. Lastly Isabella who was born in 1841, she married Dr Arthur Jamison in 1875 and it is her descendents who owned the archive. 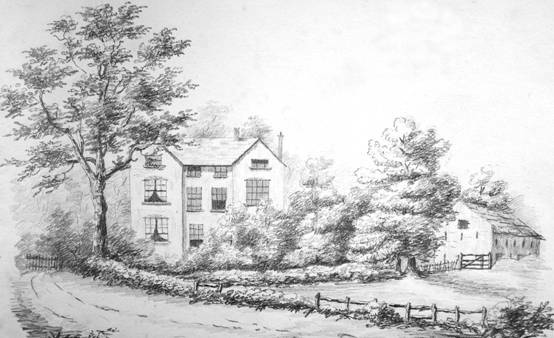 In 1837 the family moved from Knutsford to Heathfield House at Tabley. In the lease it states that Henry was allowed to convert the barn on the premises into a school room. In her reminiscences, written in about 1930, his daughter Isabella wrote that this move was undertaken because Henry’s father and brothers were declared bankrupt and thus the income he had been receiving from the family paper mill ceased. As a result he decided he had to start a school for boys to supplement his income from the Ministry and to do this they required a larger house. Over the next twenty years Henry’s pupils included sons of several local prominent families including Francis Wedgewood, Samuel Gaskell, a nephew of William, his son Philip and nephew, Frank Green. In 1857 he retired from teaching and his daughters started up a school for girls which they ran for ten years. On 9 March 1859 Elizabeth Gaskell mentions in a letter to a friend that ( her daughter) “Flossy [ Florence] is to go to school, at dear old Knutsford, with some Miss Greens, (the daughters of the Unitarian Minister there,) who are like sisters to our elder girls”. Julia Gaskell also went to the school. Florence was the same age as Isabella, who was also being taught by her elder sister Emily, and the two remained friends until Florence’s early death. There are several letters in the collection from both Florence and Julia. Henry both wrote and edited several books including “Knutsford its Traditions and History” first published in 1859. He took great interest in all that concerned the welfare of Knutsford and its inhabitants encouraging local people to study by donating books to a borrowing library in the Chapel – many of which still survive there today. At various times giving free courses of lectures on natural science and other useful and interesting subjects. . For some years he was examiner to the Home Missionary Board and a trustee and vice-president of the Literary Institute. He was also one of the promoters of the Savings Bank in Knutsford.. After his death many of his collection of books were given to the The Library of the Unitarian College in Manchester. His wife Mary died in June 1871 and he having had an operation for blindness earlier in the year, from which he appeared to have recovered well, died at 2.30 on the 9th August 1873 and was buried in the churchyard which surrounds the Brook Street Chapel. Emily, Mary Ellen and Isabella continued to live at Heathfield with their grandmother Ann Brandreth. She had been living with the family for many years and from the letters it appears that for sometime she had been suffering from dementia. Although the girls had considered moving from Heathfield due to their grandmother’s ill health they decided to stay, and it was not until after her death in May 1874 that they were then able to move away. During this period Isabella became engaged to Arthur Jamieson, a doctor at St. Helens, and they were married in November the following year. Emily and Mary Ellen Green then moved to London where they lived until their deaths. John Phillip, Henry and Mary’s only son, having been educated at the school at Heathfield went to the newly established London University at the age of 16 in 1846. At that time Oxford and Cambridge were closed to all who were not members of the established church. Several of the boys from the school also went there and remained Philips’s lifelong friends. In 1849 he gained a Bachelor of Arts Law degree passing in the 1st Division at 2nd honours and in 1850 took the Examination for the Flaherty Scholarships passing 2nd in honours. In March of the same year he went to Heidelberg University and attended there the lectures of Professors Wangeroro and Mettermaier on Roman Law and in June went on a tour in the Tyrol, Lake of Conioli and to Venice and then through Trieste, Vienna and Dresden to Berlin. During 1851 he remained at Heathfield – presumably helping teach, and it was not until January 1852 that he returned to London to commence working towards being called to the Bar. Throughout his time in London money was always in short supply, there are no letters after May 1852 and he probably had to return to Cheshire as he could not gain any outside employment to help subside his studies. When he returned to London in January 1854, he was teaching initially in a school and going to law lectures before he gaining a position in chambers. He was eventually called to the Bar in November 1856. There are no surviving letters in the first four months of 1855 and in all probability it was at this time that Philip was thinking about, and then converted, to Roman Catholicism. The family wrote to each other so regularly that I am sure that during this period many letters would have been exchanged on the matter. However, both his parents and other friends and family were very disturbed by his conversion, and it seems likely that letters on the subject were destroyed. John Phillip was both intelligent, diligent and hard working but despite these obvious good qualities he had great difficulty in gaining legal briefs, the reason for this is not clear but one can surmise that having first been a non-conformist and then converted to Rome this might not have helped his cause. After struggling for several years to gain a foothold in the profession, and being only too aware of the financial burden he had put on his family, he decided to leave and take up a position as advocate in Bombay in 1860. In 1868 he returned to England and in December married Theresa Herbert daughter of John Rogers Herbert a Royal Academician. On his return to Bombay he became Acting Remembrancer of legal affairs in November 1869 and from May 1870 to May 1871 acting judge of the high court. Philip’s sister Ellen had gone out to Bombay and during that time Theresa had a miscarriage which resulted in her to return to England in that month due to ill health, from which she never recovered, and she died in 1872. Philip returned home in the autumn of 1871 after the death of his mother, returning to India in May 1872, when he was again appointed Acting Judge of the High Court. The appointment was confirmed early in 1873 and later in the year he returned to London via Italy arriving in January 1874. He returned to Italy in March with Isabella and Agnes Herbert, his sister-in-law. After an arranged meeting with Cecilia Packer he married her in 1874 in Benevento before returning to England for a civil ceremony in London. She was the daughter of Marchese Pacca of Benevento in Southern Italy. They had three sons, Carlo, Harry and Philip. They returned to Bombay where, at the end of the 1879, he suffered a stroke which left him partially paralysed. [see appendix A]. This resulted in him returning to England in January 1880 on a years sick leave at which point he had to retire on health grounds. He and Cecilia then lived in Italy until he was killed in the earthquake on the Island of Ischia in 1883. Cecilia remained in Italy before returning to England when the boys went to school and there are several letters in the collection from and to her which have not as yet been transcribed.